Are you looking for a gaming mouse but not sure which specifications are the best? We have compiled a straightforward guide that will help you use your personal playstyle in determining the most suitable gaming mouse for you, and break down all confusing jargons in the gaming mouse industry today. What Makes a Good Mouse? 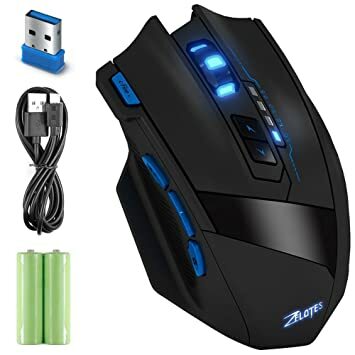 Since “good” is a subjective term, you need to realize that a suitable gaming mouse is one that blends well with your personal style of playing and most importantly, a mouse that feels comfortable to use. A good mouse will bring out your best gameplay, and aid you in achieving maximum gaming performance. Below are steps/tips you should consider when buying a gaming mouse. The nature of your mouse grip will dictate the weight and shape of the mouse you will feel comfortable to work with. The three mouse grips that people use are fingertip grip, claw grip, and palm grip. If you are a claw or palm grip folk, a heavier gaming mouse will work best for you. A fingertip grip offers an extremely agile gliding and works best with a smaller mouse. There are typically two types of gaming mouse sensors – laser and optical. Laser sensors have a high tracking accuracy and work best on smooth hard surfaces. These sensors may have issues with lift distance, and this can affect mouse tracking for a number of users. On the other hand, optical sensors are easier to use on different surfaces and provide reliable tracking for gaming purposes. In summary, the right sensor type narrows down to user preference, although non-laser mice tend to be more preferred since they perform well on many surfaces. The DPI of a mouse relates to the number of pixels a screen cursor moves per inch of the mouse movement. Hence, the nature or size of your screen will affect the DPI that suits you most. If you have a larger gaming screen, you will need more DPI than would be the case when gaming on a smaller screen. Mouse sensitivity may be used to describe DPI, but there is a slight difference between the two. While DPI refers to the hardware of the mouse and capability of the mouse’s sensor, sensitivity entails a software-adjusted setting. By adjusting mouse sensitivity, you may have a similar effect as that of using a mouse with a different DPI, and this is the reason why people use the two terms interchangeably. In today’s market, a good gaming mouse will have a DPI ranging from 3,000 to 18,000. Nevertheless, an extremely high DPI may inconvenience you due to your mouse’s oversensitivity. Fortunately, high-end gaming mice come with an adjustable DPI setting software and buttons that can help you adjust the DPI to a suitable level. CPI is the physical resolution of the camera used in the sensor of a mouse and represents the sampling rate per inch. A mouse CPI determines the number of pixels that the sensor can image over a distance of one inch. The difference between CPI and DPI is embedded into the mouse’s software algorithms. CPI may be converted to DPI through splitting pixel sizes further through software algorithms. Hence, DPI will always be more than or equal to CPI and is usually in multiples of 4. Choosing between a wired or wireless mouse comes down to a battle of convenience and reliability. Regardless of what manufacturers say, wired mice tend to be more reliable than their wireless counterparts. This is because wireless mice are capable of increased latency when communicating with the computer as they are susceptible to interference. On the downside, wires tend to be ugly and cumbersome, and are not convenient when gaming from a distance. Wireless mice are convenient to use from a distance and if you get a high-end model, it will work flawlessly 99% of the time. A number of gaming mice come with empty compartments and weights to enable you to fine tune your mouse for an awesome experience. Weight matters when looking for a gaming mouse as it will make a difference in how naturally and swift you can move it. All the best as you look for a suitable gaming mouse. If you need to see the top trending gaming mouse brands of 2019, click here. We have compiled hundreds of gaming mice reviews to keep you and other gamers around the world enlightened.